Norfolk Property Online presents a four bedroom detached house in the Whispering Oaks development of Wymondham. 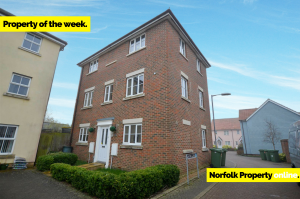 This three storey property features a modern kitchen breakfast room, utility, w/c and dining room on the ground floor with a dual aspect sitting room, study and master bedroom with en suite on the first floor. On the second floor, there are a further three double bedrooms with family bathroom. The property is a fantastic family home and offers flexible living accommodation, especially benefiting families with older children. To the rear is an enclosed garden and access to a single garage. This property is currently taking offers in excess of £290,000. The historic market town of Wymondham offers a wide range of local shops and amenities. Wymondham High School is an outstanding secondary school facility, whilst the town offers an ensemble of primary schools. The town is a short 10 miles from Norwich and can be easily accessed via the A11.